Sharp shows curved, frameless and 8K screens at IFA 2016 | What Hi-Fi? Sharp is bidding on making a serious return to the TV landscape in Europe and has a crazy collection of screens to prove it. After a period of quiet uncertainty, Sharp is aiming to make a triumphant return to the TV market in Europe, with a full range of new Sharp TVs announced at IFA 2016. Alongside the new HD and 4K Sharp TVs on display were a selection of 'future screens' sporting the latest example of Sharp's famous IGZO display technology. 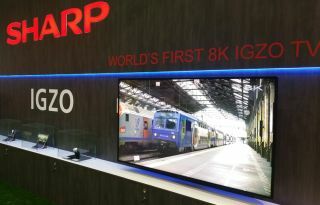 Sharp showed not one but three 8K resolution screens: two big-screen monsters (85in and 98in size), and a 27in monitor, each of which packed in over 8,000 pixels. There were also 'frameless' and 'free form' displays, allowing Sharp to show quite how many crazy-shaped screens it's capable of manufacturing. Circular TVs, curved displays and even a smartphone prototype with a screen that completely covered the phone's body, were all on show. IGZO stands for Indium, Gallium, Zinc and Oxygen, the main components of Sharp's TV tech, which the company claims allows for closer together pixels, allowing for an increase in the number of pixels per inch (PPI) and an improvement in the picture. The transistors that control the pixels on the LCD panels are also said to be considerably smaller on IGZO panels, again improving picture performance but also reducing power consumption. We look forward to seeing the proof of the pudding in the form of the new Sharp TVs and these more extravagant screen designs.